2017 Waterloo Chronicle Readers Choice Awards Winner! 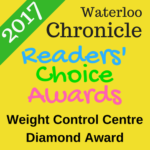 We've won the top 2017 Waterloo Chronicle Readers Choice Diamond Award thanks to your support! LillyPad Health will continue to work and improve to maintain the high level of service and support our clients have come to expect from us.